Conceptualizing the idea of a "millennial box"
Millennials Are Killing Everything (M.A.K.E.) was a project for PlayLab, a course about future-casting. The prompt was to observe a microfuture (a possible predictor of the future in the present) and project it into the future with a visual or experiential design. The inspiration for M.A.K.E. came from Twitter; I saw that a user had collected a list of headlines from various specialty publications all containing similar phrases about millennials killing their industries, and added a caption that poked fun at their sensational tone. I was intrigued by the ubiquity of the "generation of murderers" idea and decided to explore a future in which these predictions actually come true. I eventually decided on the idea of M.A.K.E.-branded VR experiences, representing the type of simulations that would be offered through their packaging and branding aspects. This allowed me to hint at the future the product would exist in through the physical and visual aspects of its design. 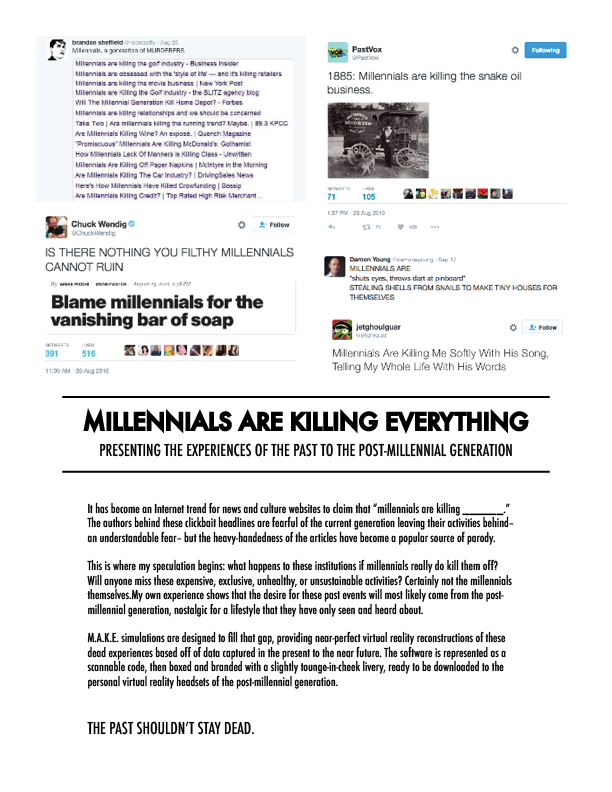 It has become an Internet trend for news and culture websites to claim that “millennials are killing ______.” The authors behind these clickbait headlines are fearful of the current generation leaving their activities behind– an understandable fear– but the heavy-handedness of the articles has become a popular source of parody. This is where my speculation begins: what happens to these institutions if millennials really do kill them off? Will anyone miss these expensive, exclusive, unhealthy, or unsustainable activities? Certainly not the millennials themselves. My own experience shows that the desire for these past events will most likely come from the post-millennial generation, nostalgic for a lifestyle that they have only seen and heard about.